Student travel equals budget travel, which means you will have lots of people sharing rooms (hotels, dorms, and hostels) and enduring long bus rides. Tuck a couple pairs of disposable earplugs into your bag so that no matter what sleeping situation you find yourself in, you will be ready. Most students over pack and under budget. You won't need as much clothing as you think you do and you will definitely need more money. I have never heard a student say, "I budgeted too much, I have so much money." It is almost always the reverse. You can also snap a pic on your phone. Having copies tucked safely in your apartment and back home will make your life so much easier if any of your important documents (passport, ID, credit card, etc.) are stolen or misplaced. This is the cheapest and easiest way (in Europe for sure), you can read more about using your cell phone abroad here. Or at least attempt to -- "hello," "thank you," and "please" go along way in any language and country. Traveling requires a lot of walking and luggage hauling. You will enjoy the experience more and your feet will hurt a lot less if you aren't completely out of shape. You don't need to train for a marathon, but putting in the effort to hit the gym or walk more before departure will go a long way. Make the most of your time abroad by traveling on the weekends. If you're in Europe you can basically see a new country every weekend. If you're in Florence, I highly recommend traveling with my friends at Florence For Fun. I like the universal ones, instead of country-specific, because if you do travel on weekends you are prepared. Even when you use a voltage converter and adaptor, these items never seem to work properly (unless they are dual voltage). Fortunately, these items are not very expensive and easy to find abroad and it will save space and weight in your suitcase (you can read more of my tips for space and weight saving here). As someone who gets car sick, I was not excited about the idea of a 10-hour bus ride to Budapest. But I bought some motion sickness pills and settled in with a pillow and a blanket and it wasn't terrible. It is one of the cheapest ways to travel and once I arrived in Budapest, it quickly became worth it. This is important especially if you're planning on traveling. It may be mild in Florence in the fall, but you might want to ski one weekend in Switzerland or lay on the beach in Santorini. Again, especially true if you want to travel. And even more important if you are flying discount airlines. You can find good plans online and customize them to your travel needs. You will take a ton of pictures and they really are the best souvenirs. Bring something that reminds you of home for those days where you are tired, grumpy, and missing home. Be adventurous in all things -- what you eat, where you travel, and what you do! Some of my most amazing experiences were when I put my fear aside and just went for it. This might seem like a non brainer, but when you're busy traveling and tap water is not free like it is back home, you often forget. Make an effort to drink lots of water, even if it's more expensive than you think it should be. Setting goals and making a bucket list will keep you motivated when your tired. Traveling every weekend and living in a foreign country can be exhausting, but it is so worth it. While traveling with friends and other students is fun, exploring on your own and learning how to navigate and interact by yourself in a foreign place is very important. There are just so useful when you travel, trust me! Traveling is so much easing and cheaper when it is well planned. Take the time to research where you are going and what you want to do and book ahead whenever possible. 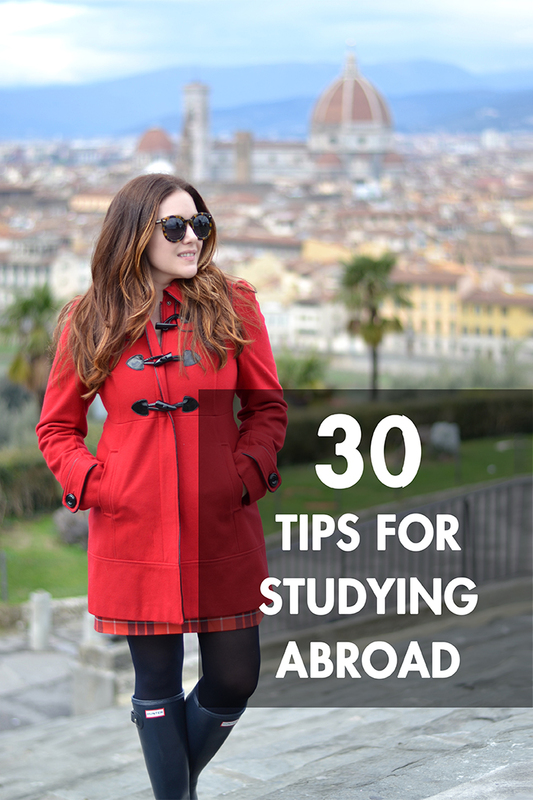 Don't go into a semester abroad expecting to have lots of time to relax or that you will come home well rested. It is a once in a lifetime experience, which means it is completely worth all of the early mornings, late nights, and long travel days. Your cell phone may not always work, so it is nice to be able to fall back on an old-school map. It will also give you a better sense of the city, which will help you navigate. This saves space and weight when it comes to packing. You can read all of my space and weight saving tips here. It is a great way to keep track of all of your adventures and it lets your friends and family follow along. Most travel cards minimize exchange fees and international purchase fees, plus you can earn miles or points for your next adventure. Between Google translating, mapping your location, and taking a million photos, you phone battery will betray you. I absolutely love my Mophie case. It has been a life saver on numerous occasions.